We took a tour of Fenway Park in the afternoon. It took about an hour and I would very much recommend it as something to do in Boston. Although our guide told us it was much better in the sunshine we had than in the rain we'd had the day before. One of the first stops on the tour was the area we were going to be sitting in that night. Our friendly tour guide told us they were the original vintage 1932 wooden seats from when that stand was built. Decent view, though. Speaking of our tour guide, I'm embarrassed to say I've forgotten his name, but he was great. As you would expect he seemed to know everything you could possibly know about the ball park. Fenway Park has a high wall on one side of the outfield known as the Green Monster after it was painted green to mute glare from the floodlights. There are seats on top of it. The Red Sox's mascot is called Wally. He's a Green Monster too. It being Star Wars night, there were plenty of people dressed up to bring a bit of a galaxy far.far away home to Boston. We had to pose with these two. Cathy insisted. 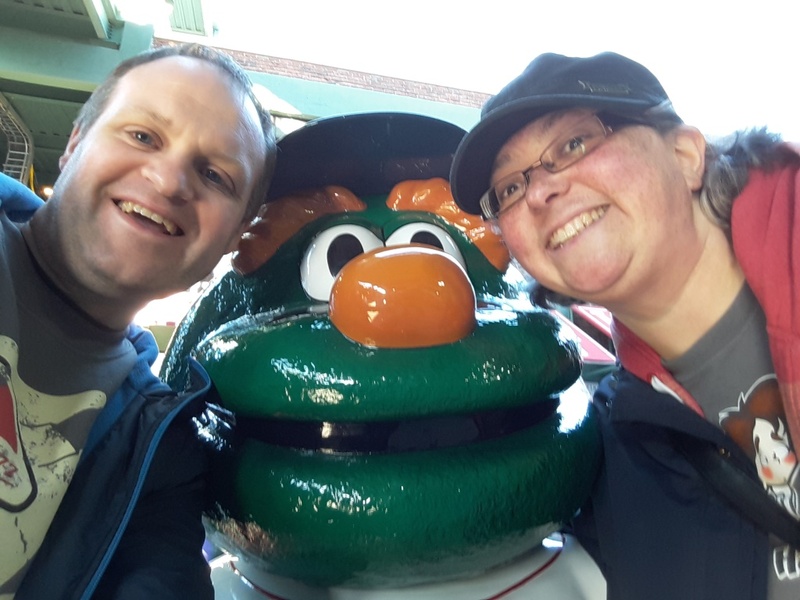 Remember Wally the Green Monster? He was up for the occasion too, dressing up as a Jedi. And picking a fight with Darth Vader and his evil henchmen. 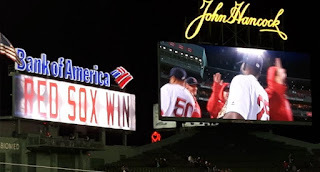 It's well worth just wondering around Fenway Park. There's tons to see. Like an array of old logos on one wall. I wonder why they didn't keep the batting sock? There was also a baseball shaped golf cart to play on. One of the the big things about baseball is the amount and variety of stadium food you can buy, brought direct to your seat by vendors. But this was the first time I've seen a food vendor carrying round clam chowder. We had a pretty good view of the action when the game started. The Athletics raced into an early lead, but a disastrous fourth inning saw them start with a 4-1 lead and end with a 7-4 deficit. 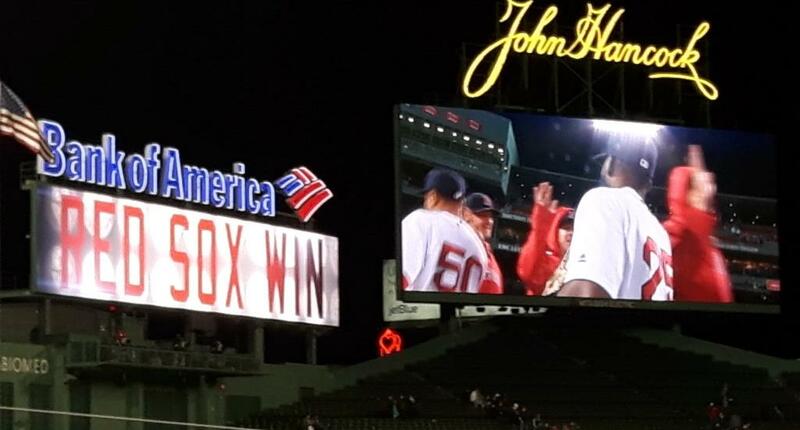 The final score was 14-7 to the Red Sox. The crowd emptied out as the scoreboard proclaimed the win.